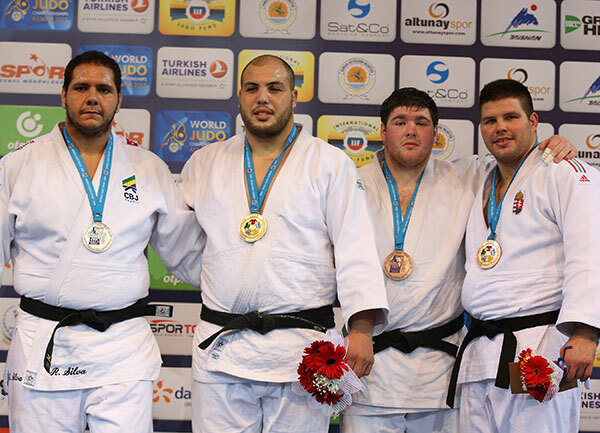 The Samsun Grand Prix 2015 came to a riveting finale as the heavyweights went toe-to-toe on the third day at the Yasar Dogu Sports Arena on Sunday. The remaining 156 athletes competed for the title of Grand Prix winner. This Grand Prix concluded the first part of the year as the next IJF World Judo Tour event will take place in Croatia with the Zagreb Grand Prix 2015, from May 1 to 3, with April being traditionally dedicated to the continental championships. In the upcoming days, the IJF will remain in Turkey and work together with the Turkish Judo Federation to promote judo and its educational values, through the Judo for Peace program, in the South of the Country and in Refugee Camps on the Syrian Border. Mr. Fatuh YUSAL, the Turkish Judo Federation President, said: “We have two coaches in that region, who started to teach judo one year ago to the Syrian children who escaped from the war in their country. 300 children are already involved. We now have a contract with the Sport Department to promote judo and its values. This is a very sensitive project and we consider that for us it is important to use judo to help those children to get a better life. Maybe new champions will emerge from this group in the future. There are more than 20 refugee camps sitting on the border with thousands of people living in difficult conditions. Our Sports Ministry wants to promote judo as well as other sports. The final opposed Madeleine MALONGA (FRA), who proved today in Samsun that she might represent the future generation of French champions. Until the final she spent a little bit more than four minutes in total on the tatami, winning without any problem her three preliminary fights by ippon, especially against the top seeded athlete, Luise MALZZAHN (GER) in the semi-final scoring a waza-ari, immediately followed by an immobilisation. In the final she was opposed to Natalie POWELL (GBR), winner of the Astana Grand Prix 2014 and already silver medallist last year here in Turkey. After one minute, both athletes had received one shido each even if MALONGA seemed more fresh and precise in her attacks. This was confirmed a little bit later, when the French judoka finally could score with her ample uchi-mata for yuko, which she immediately followed on the floor for osae-komi for ippon. The first bronze medal fight opposed the silver medallist of the Abu Dhabi Grand Slam 2014 Victoriia TURKS (UKR) and the 2013 world champion from North Korea, SOL Kyong. But SOL having been disqualified in the previous round, the victory went to Victoriia TURKS. 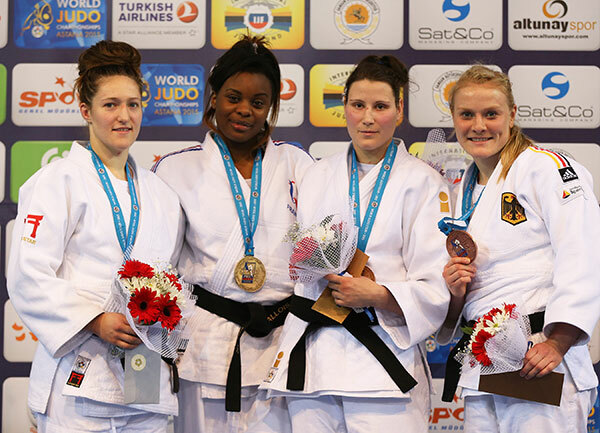 In the second bronze medal contest Maike ZIECH (GER) faced her teammate Luise MALZAHN (GER), winner of last year’s edition of the Samsun Grand Prix. Giving no chance to her opponent, MALZAHN defeated her with ko-soto-gake for waza-ari followed with an immobilisation for ippon. World number six and top seeded athlete, Nihel CHEIKH ROUHOU (TUN), confirmed to be the favourite of the competition by entering the final of the last women’s category of the event. 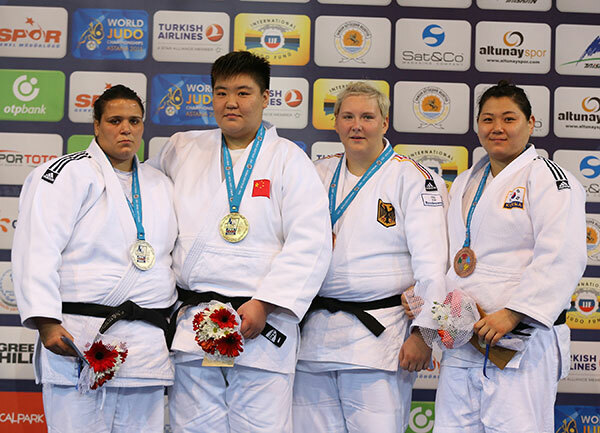 China have a strong tradition of women’s heavyweight competitors and also placed its athlete in the final. Last week, it was YU Song who won the Tbilisi Grand Prix. In Samsun it is MA Sisi who faced the Tunisian to top the medal podium. A first attempt to score with a shoulder movement by the Tunisian was easily blocked by the Chinese fighter, who looked stronger. But then CHEIKH ROUHOU scored a beautiful yuko with a ura-nage. But that was not enough to win today in the women’s heavyweight category and MA Sisi took the opportunity of a small mistake of the Tunisian to immobilise her for ippon. The first bronze medal fight opposed the winner of 2013 Tashkent and Almaty Grand Prix, Gulzhan ISSANOVA (KAZ) and Jasmin KUELBS (GER), who was defeated by the Chinese in the semi-final. The German athlete won the medal on penalties. The second bronze medal contest took place between KIM Jiyoun (KOR), who was not among the favourites of the competition and the silver medallist of the last European Championships in Montpellier last year, Larisa CERIC (BIH). Only 10 seconds were required for KIM to score a first yuko with an opportunistic de-ashi-barai. The Korean was able to keep that advantage until the end of the fight to win the bronze medal. Noel VAN T END (NED) once again entered the final of a World Judo Tour event, confirming his top seed position. Already the winner of the Qingdao Grand Prix last year, and second in Abu Dhabi and in Baku (both are Grand Slams), the Dutch fighter demonstrated all of his talent today on the Turkish tatami. In the final, he was probably expecting to meet his teammate, Guillaume ELMONT, but he was defeated in the preliminary rounds. Thus VAN T END faced the silver medallist of the Zagreb Grand Prix 2014, Aleksandar KUKOLJ (SRB). The first attack came from VAN T END after a few second with one-hand-shoulder movement for no score. Continuing to attack, he made his opponent being penalised for passivity. KUKOLJ was again penalised for a gripping error. Just after half of the final had elapsed, VAN T END concluded the first real opportunity with a ko-uchi-gari for waza-ari, which was actually transformed into a yuko by the video refereeing. 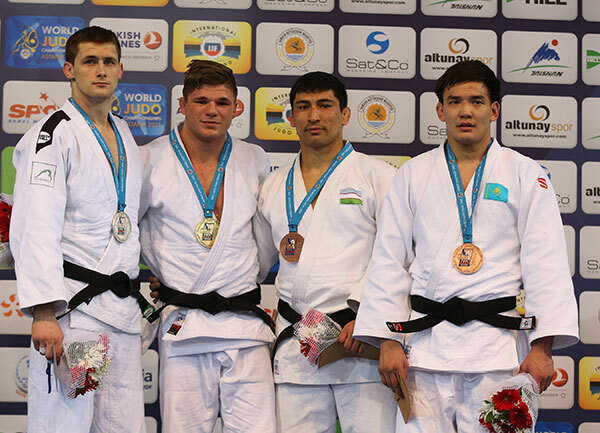 The first bronze medal fight saw the winner of the 2013 Tashkent Grand Prix, Sherali JURAEV (UZB) and the bronze medallist of the European Championships in 2013, Karolis BAUZA (LTU), fighting for a place on the podium. As none of the fighters were able to score anything, the victory went to Sherali JURAEV by a penalty. The Dutch judoka did not take too much time to add a second yuko with his homemade one-hand-seoi-nage to add a first victory to his prize list in 2015. The second bronze medal fight opposed Islam BOZBAYEV (KAZ) and Li KOCHMAN (ISR). Both athletes were not among the favourites of the category. After one minute and 10 seconds, BOZBAYEV produced his first effort with a morote-seoi-nage, which started from a distance, but concluded with a yuko. Then the Kazakh was penalised with a shido for stepping outside of the fighting area, after having already received a first penalty for passivity. The situation started to become a little complicated when BOZBAYEV received a third penalty with one minute and 27 seconds remaining on the clock, but a superb action-reaction ippon-ko-uchi gari for waza-ari, gave him a bit of fresh air. The last thirty seconds were very difficult for the Kazakh, but he could maintain his advantage. 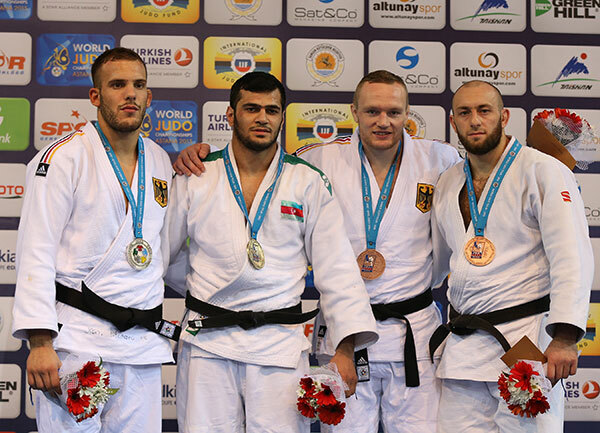 In the men’s -100kg category the favourite of the competition was Elmar GASIMOV (AZE) and he confirmed this by entering the final, where he was opposed to the world bronze medallist Karl-Richard FREY (GER), who this time defeated his teammate and Olympic bronze medallist Dimitri PETERS. FREY was penalised with a shido for a wrong grip and then both athletes were penalised for passivity, giving a small advantage to GASIMOV. But with the Azeri fighter being also penalised for passivity, it was time for golden score. Anything was possible from there. Finally after a last attack from GASIMOV, countered by FREY, but again countered by GASIMOV, the Azeri could score a waza-ari and showed his joy after a very tough fight. The first bronze medal fight opposed the winner of the 2013 Moscow Grand Slam, Javad MAHJOUB (IRI), and Dimitri PETERS (GER). But the German, already very experienced at that level gave no chance to his opponent. After having scored a yuko with a counterattack on tani-otoshi, he concluded with an armlock for ippon. In the second bronze medal fight the Belgian Toma NIKIFOROV (BEL) defeated by PETERS in the quarter final, was opposed to Arsen OMAROV (RUS), who was not among the favourites. NIKIFOROV could be a little disappointed as OMAROV seemed to be beatable, but totally exhausted he could not avoid bring penalised three times before OMAROV scored a yuko with a counterattack. The three penalties received by Russian did not change the final results, the bronze medal going to OMAROV. 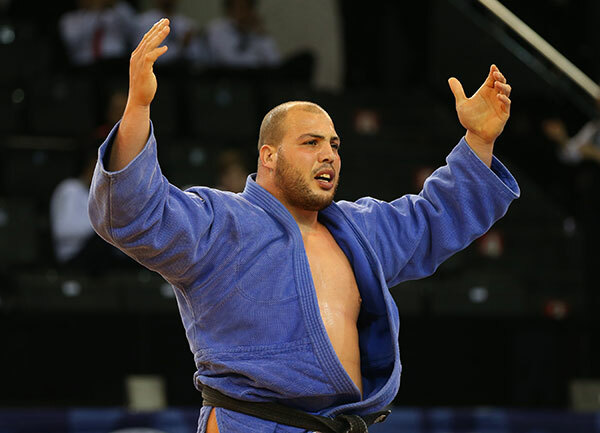 The final of the men’s heavyweight category opposed the two favourites of the competition, world number two, Rafael Silva from Brazil and Faicel JABALLAH from Tunisia, who was happy to come back at this level after his defeat at the first round of the Düsseldorf Grand Prix in February. Being passive, the Tunisian was the first one to be penalised with a shido. It was then time to penalise both athletes for passivity as they were just opposing force against force. But Silva also got penalised two times, the advantage going to JABALLAH, who maintained the shido difference until the final gong. The first bronze medal fight opposed Iurii KRAKOVETSKII (KGZ) and Ushangi KOKAURI (AZE) who were not among the eight top seeded athletes of the category. Five minutes were not enough to decide the winner, it was time for golden score and a last false attack by KOKAURI gave the victory to Iurii KRAKOVETSKII. The second bronze medal contest saw BOR Barna (HUN), winner of last year’s Astana Grand Prix, and Iakiv KHAMMO (UKR) fighting for a place on the podium. The two penalties given to KHAMMO were enough to offer the bronze medal to BOR Barna.